75% of people suffer from this! Are you one? 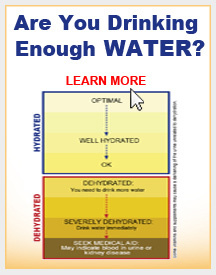 Did you know that most people are chronically dehydrated? This is a huge problem in our culture as the body is made up of mostly water and therefore requires a sufficient amount to carry out vital functions such as breathing and brain activity. Water is the basis of all life and that includes your body. Your muscles that move your body are 75% water; your blood that transport nutrients is 82% water; your lungs that provide your oxygen are 90% water; your brain that is the control center of your body is 76% water; even your bones are 25% water. Water regulates the body temperature, as the cooling & heating is distributed through perspiration. Water helps to alleviate constipation by moving food through the intestinal tract and thereby eliminating waste – the best detox agent. In addition to the daily maintenance of our bodies, water also plays a key role in the prevention of disease. Drinking eight glasses of water daily can decrease the risk of colon cancer by 45%, bladder cancer by 50% and it can potentially even reduce the risk of breast cancer. If your having trouble reading this, then drink up because you are probably dehydrated. Are you bored with plain old water? 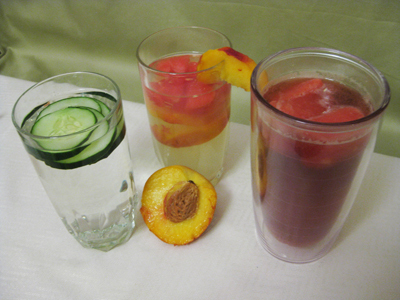 Try these fun hydrating beverages to add a little excitement to your drinking experience. Enjoy! ← “Lily Love’s version of the downward dog pose”!